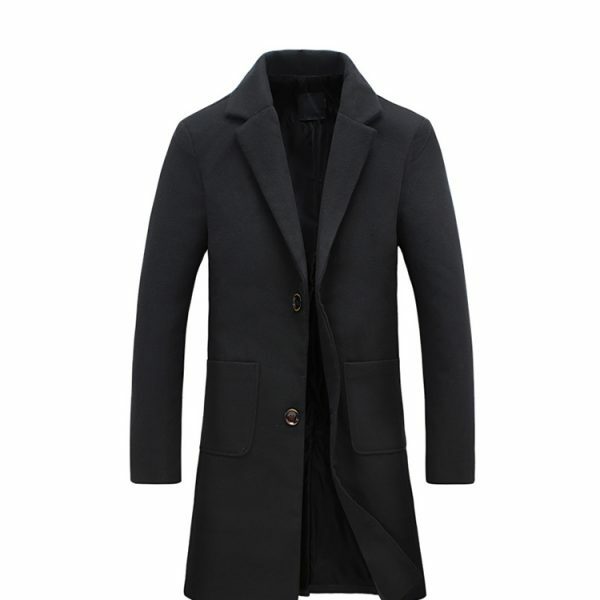 This men’s wool overcoat is a slim fit designed garment. We strongly advise that you check your measurements with the size chart before placing your order. The size chart below is for reference only. If you have any questions regarding what size selection would be right for your body type, please contact us and we will be happy to help you. Classicly styled yet still sleek and modern, this men’s wool overcoat is a great addition to any gentleman’s outerwear collection. Finely crafted from a high-quality wool blended outer material and fully lined with cotton broadcloth for your comfort. This men’s wool overcoat has a single-breasted design, comes equipped with two large outer pockets and a double button closure. The slit seam in the back of this coat provides extra room and comfort when fully closed. It is available in four sizes as well as four colors to choose from – red, blue, black and light gray. You can brave the cold weather and still look stylish and sophisticated in this men’s wool overcoat. It is easy and affordable to take your look up to the next level when you purchase one of these beautiful long wool overcoats for your collection today.